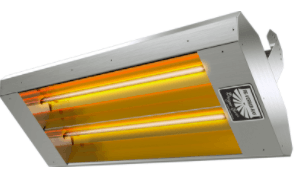 Infrared heaters transfer heat by radiating it directly to the body to be warmed instead of intermediately by first warming the intervening air mass. 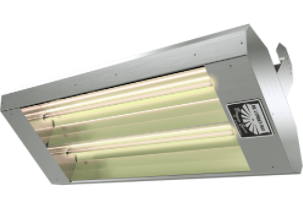 While gas-fired infrared heaters are quite common in commercial applications, electric infrared heaters are sometimes required and/or more desirable. They are exceptionally efficient, converting around 86% of electric energy into radiant heat energy, with the remaining 14% entering the room via convection/conduction. 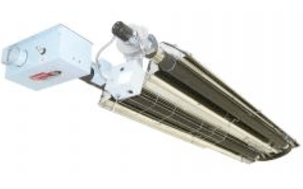 At ATI, we can connect you with the DRP line of infrared electric heaters, which are tough-built, fast, effective, and efficient at heating, and have minimal impact on the environment. Short wave infrared electric heaters operate by encasing a filament in a gas-filled, tubular lamp that emits both heat and light. They are particularly valued for quick adjustments to changes in voltage and for extremely precise temperature-control. Medium wave infrared electric heaters use an alloy filament that excels at creating a steady, even-temperature heat stream. They are also great for extended use since they convert 80% to 90% of electric energy into infrared energy. 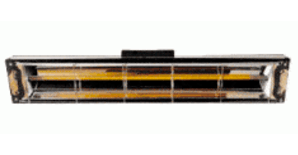 DRP, a proven leader in the infrared heating industry with over six decades of experience, manufactures a large variety of high-quality, low intensity gas-fired tube heaters. We at ATI have chosen to connect our customers with DRP heating products because we want to provide them with the best heating solutions available on the market today. These are full air/gas modulating heaters with three different performance-curve selection options, along with Blast Mode™ for extra-quick heating in extreme conditions. This is today's top energy-efficient heater in its class, its patented two-stage technology enabling significant energy savings. The DET3 is an affordable, quality two-stage with spark-ignition and hot-rolled steel emitters. The DX3 gives you hard-to-match quality/performance among single-stages, with its stainless steel burner and protectively coated steel tube exchangers. Exactly like the DET3 but single-stage. Both economy heaters are considered best in class. 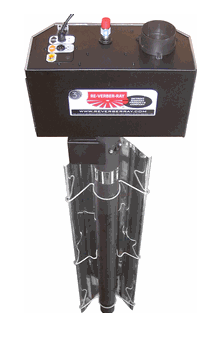 The SS is adapted for use in wet, contaminated, or other harsh outdoor/indoor environments. Its 304 and 409 gauge stainless steel construction fits it for the job. 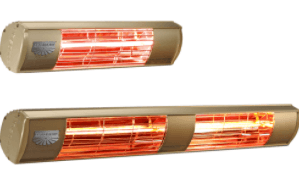 This is a special class of commercial/industrial low intensity infrared tube heater. 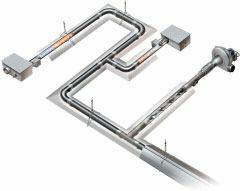 It moves hot gases along runs of emitter tubing by creating a vacuum with a special pump and uses multiple burners to heat the gas. It is mostly used for larger applications and when extended venting is required. This series is custom-fit to each building, and utilizes two-stage and condensing technologies to achieve maximum efficiency. 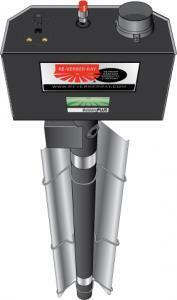 CSA-certified for indoor/outdoor use, the QTD combines modular design with high versatility. Its "enhanced" two-stage technology increases both comfort and efficiency, and its heat outflow is characteristically broad and even. The QTS Series is essentially equivalent to the QTD, except single-stage. It is still very energy-efficient. 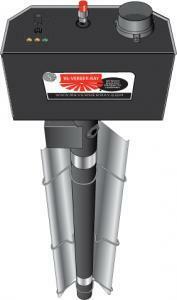 The SV Series is on the cutting edge of vacuum heater technologies. 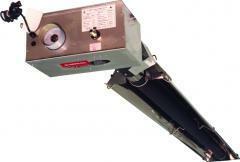 It has a solo vacuum system with DRP's famous "vortex burner" to render ideal heat distribution. It has many other top features as well, like being high-wind rated, exceptionally quiet, and equipped with self-diagnostic controls.